When working your phpMyAdmin and PHP, you will often work with a language called SQL, which is the way your program will talk to the database. This language talks through an engine called MySQL to update, create and delete information from the program's databases. At times, you may end up troubleshooting various errors such as syntax errors for MySQL within your php code or phpMyAdmin tool. It can be helpful to understand which version of MySQL you are using. Below is a quick guide on finding the MySQL version in use on your hosting servers. Log into your cPanel admin dashboard. From the main cpanel area, look for the Databases catagory. Find and click on the phpMyAdmin icon to activate the tool. 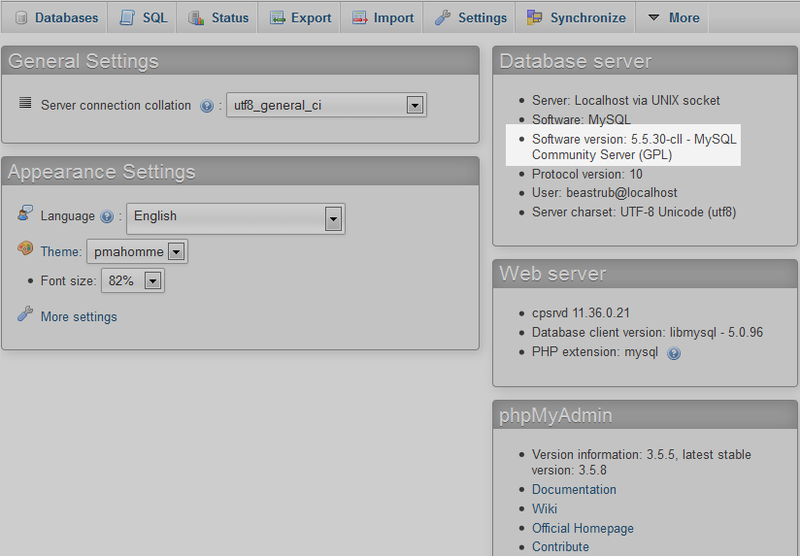 From the main phpMyAdmin page, look to the far right side of the page. There is a block entitled "Database Server". Look for the field named Software version. Next to that label is a number. That is your MySQL version number.